Harsh words for a horse[bleep] weekend. That was Jake Arrieta's point Sunday afternoon when he openly challenged his club following a woeful 6-1 loss to the Giants on Sunday at AT&T Park in San Francisco. "Overall, it's just a really [awful] series," Arrieta told reporters afterward (see video). "Really bad. Really bad." 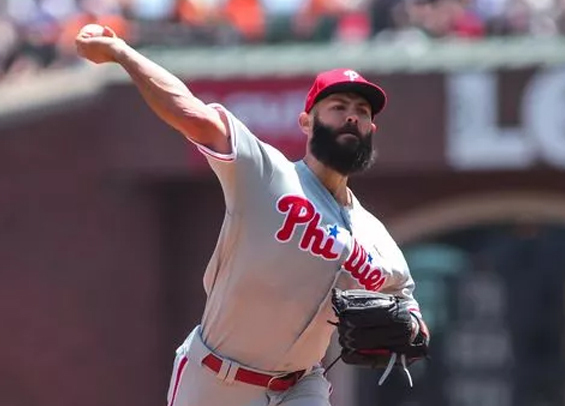 The Phillies scored one run over the entire three-game set in San Francisco, and it came via a solo homer by Arrieta in the third inning on Sunday. Yes, a pitcher accounted for the Phillies lone offensive triumph this weekend. Things are that bad right now. Arrieta breezed through five innings, but the wheels fell off in the sixth as Gorkys Hernandez lofted a single to center and Alex Hanson followed with an excuse-me check swing to Scott Kingery at short and beat the throw to first. Joe Panik then singled to left scoring Hernandez to even the contest before things came crashing down. Buster Posey chipped a single to right scoring Hanson, and Andrew McCutchen followed with a three-run homer just inside the foul pole down the right-field line. Just like that, the Phillies were down 5-1. Arrieta was hot afterward, questioning the logic behind the Phillies use of defensive shifts and Kingery's decision to not take a shot at second base on Hanson's grounder in the sixth. Baseball Info Solutions Tweeted Sunday the Phillies rank last in the majors via runs saved by the shift (-11). For perspective, only one other team in baseball has a negative run saved total (-1 Dodgers). Jake Arrieta had harsh words about the Phillies performance in defensive shifts. The issues for now though go far beyond shifts. The Phillies are hitting just .238 over the last 30 days and are two games over .500 during that span. Perhaps even more concerning is the .303 on-base percentage (20th) and 26.1 percent strikeout rate (2nd). The club now heads to Chicago for a three-game set with the Cubs who have won eight of their last 10 contests. It'll be a tough series, but it's vital the club bounces back from the disaster that was San Francisco. Manager Gabe Kapler isn't overly concerned with any long last effects from a lackluster trip out west despite the fact his club not sits three games off the pace in the NL East. “I don’t have an ounce of concern long term," Kapler said (see video). "Because we have the same group of talented individuals that we had when we were working deep counts, scoring more runs, having more success, making more solid contact. “To take it to a statistical place, we have strong expected outcomes going forward. I don’t even think that’s necessary to dive into, but we have the same personnel and deep lineup we had before, minus Rhys (Hoskins), and he’s not far away either. So for all of those reasons, I’m not concerned about the long-term prospects of this offense.